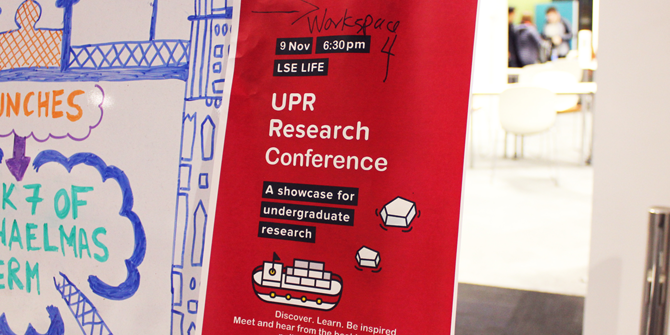 On Thursday 9 November around seventy students attended the 2017 UPR Research Conference in the LSE LIFE Centre. Through the course of the evening attendees heard presentations on four excellent pieces of dissertation research covering a diverse range of topics, all showcased by Department of Government undergraduates. Joel Pearce kicked off the night with his very topical paper on the role of populist rhetoric in the 2016 US presidential election. Guillaume Paugam then intrigued the audience with his comparison of how international warfare and football share many a commonality. Next, James Sanders provided an insightful analysis on the contrasting arguments used by the Remain and Leave camps during the Brexit campaign. The presentations were brought to a conclusion with Peter Wilson’s thought-provoking paper on the potential for polygamy to be accepted in the modern age. Our presenters also each had their own discussant, a senior academic from the Department of Government, to provide expert evaluation of the merits and potential improvements that could be made to their research. Professor Schonhardt-Bailey, Dr John Hutchinson, Dr Paul Mitchel, and Dr Kai Spiekermann each provided insightful assessments of the work of our presenters, allowing the many future dissertation students in the audience to see first-hand how to construct a high quality dissertation. The night ended with an informal drinks reception, providing an opportunity for our attendees to interact with our speakers, furthering the lively discussion and leaving many budding political scientists inspired. After all the hard work and planning, the conference was a huge success. In particular, the comments by academics on each dissertation helped to foster a dialogue between the students, the discussants and the audience. The informal Q&A and drinks following the presentations also proved invaluable. 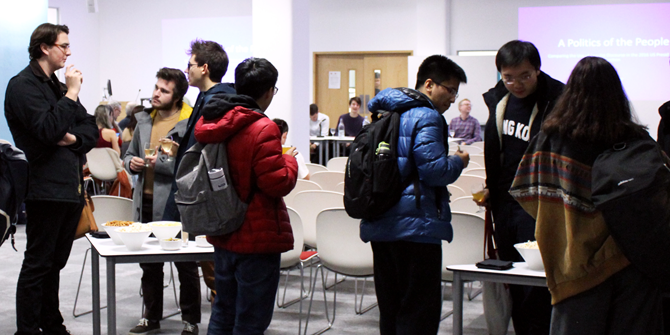 Students, academics and audience members all had the chance to discuss the presentations with one another. This meant that people could engage with the presenters, and receive an in-depth response to any questions or thoughts they’d had during the event. 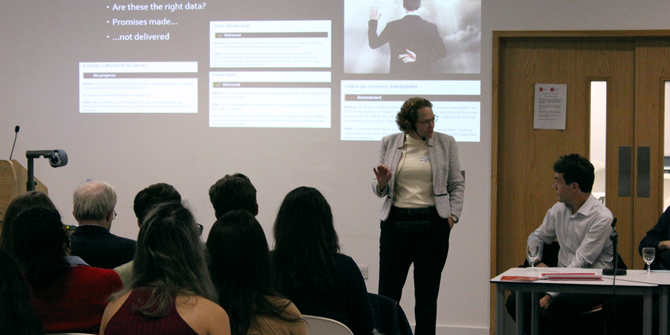 Not only was it an informative evening for those who attended, but it also provided a fantastic opportunity for each student presenter to reflect on their dissertation, its strengths and areas for future improvement. We look forward to building on yet another successful UPR Conference next year as we anticipate a new batch of brilliant dissertations from our current third year students. See you in November 2018! This is an extract from a blog piece written by LSEUPR Events Managers Karina Moxon, Trishna Kurian and Naomi Potter for the Government Department Blog. Read the full blog piece here. Karina Moxon is Events Co-ordinator and Copy Editor at the LSEUPR and studies BSc Government and History. Trishna Kurian is Events Manager at the LSEUPR and studies BSc Government and International Relations. Naomi Potter is Events Co-ordinator and Copy Editor at the LSEUPR and studies BSc Politics and International Relations.